MOSCOW (Sputnik) - As many as 450 people were detained in an unauthorized yellow vest protest in the Belgian capital of Brussels on Saturday, with 10 individuals having appeared in court, the city's prosecutor's office said. "The Brussels Prosecutor's Office can provide the following information. At this stage, the issuing of arrest orders has been confirmed for 10 people," the prosecutor's office said in a statement, adding that as many as 450 people had been subject to administrative detention. — Mehmet Solmaz (@MhmtSlmz) 8 декабря 2018 г. According to the statement, a minor was among those arrested by the police. An unauthorized yellow vest rally began in Brussels at about 10:00 GMT on Saturday. The protest action has seen sporadic clashes between demonstrators and the police. — Jack Posobiec 🇺🇸 (@JackPosobiec) 8 декабря 2018 г. On November 30, yellow vests protests were held in Brussels, which resulted in dozens of detentions. 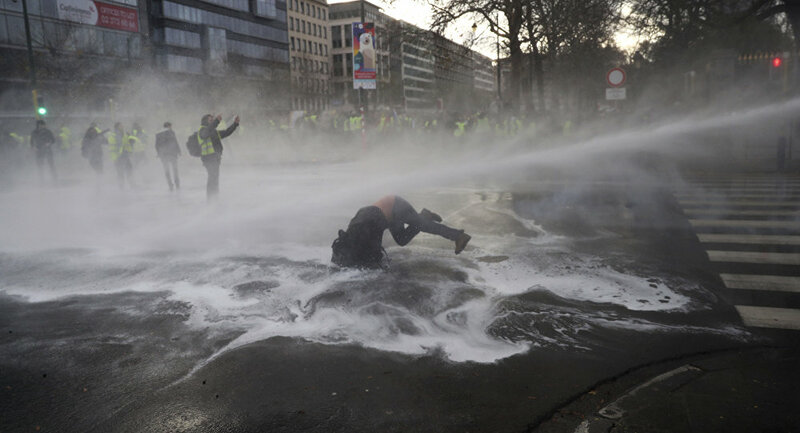 The demonstration followed weeks of similar rallies against fuel tax increases, which have been raging in mainland France and its overseas territories since November 17.